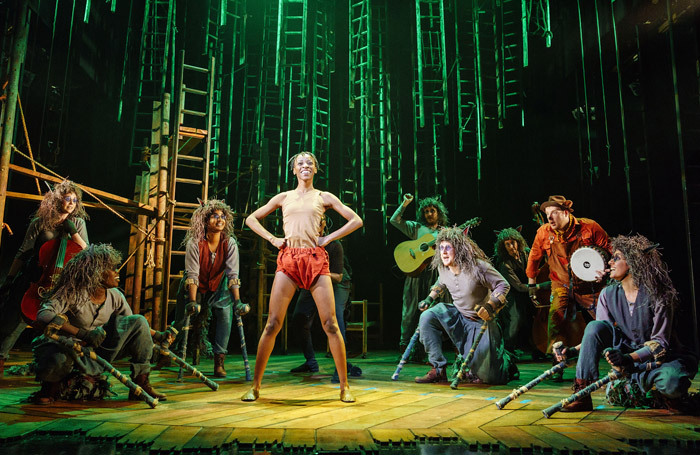 There’s a flavour of the concrete jungle about this new musical take on Kipling’s classic from the Royal and Derngate, Northampton, and Chichester Festival Theatre-led Children’s Touring Partnership. Metal ladders hang like creepers from the heavens and thrust up like trees from the stage floor. Balloo teaches Mowgli to steal honey from a suspended paint bucket. A posse of monkeys hangs around practicing street dance moves and screeching “amazeballs”, when not eating each other’s bogies. But no style or idiolect dominates in a show that has its joyfully inclusive spirit defined by the line “we all bring something to the party”. While most adaptations of The Jungle Book grapple awkwardly with Kipling’s racist overtones, writer Jessica Swale goes foraging for a diversity narrative. A panther and a bear adopt a boy: “The perfect modern family!” as Dyfrig Morris’ bumpkin-like Balloo exclaims. The boy wrestles with his identity but ultimately learns here, with a nudge from Deborah Oyelade’s fierce feminist Bagheera, that there are no rules when it comes to belonging. This allows Max Webster’s production enjoyably loose stylistic rein. Shere Khan stalks the jungle in an Elvis-style jump suit. The wolves go four-legged on crutches and double as shaggy, shade-wearing musicians. There’s simple puppetry and a beautifully choreographed deer hunt. But it all coheres through Swale’s pacy, comic script and Joe Stillgoe’s 12 original songs, underpinned by on-stage Portuguese percussion. They include a memorable solo for 26-year-old actress Keziah Joseph as Mowgli, where arrhythmic complexity resolves into melodic wolf howls. “No one,” she sings, “will tell me who I am”.